To be able to program all the necessary Parameters yourself, you need the COMMUNICATION INTERFACE with it's Software. From the upper menu select Edit, followed by TC Setup to locate the Pit limiter settings. • Enable PIT Limiting. Tick the box to activate the pit limit system. • Speed limit (km/h) – At this speed the TCS will start to cut cylinders which will be felt as a misfire. • dSpeed range (km/h) – This value is added to the Speed Limit to create an upper boundary. If the bike reaches Speed limit + dSpeed range (eg: 60+6 = 66km/h) the majority of coil signals are cut. Between these 2 levels the cut becomes progressively more severe. The Pit limiter option is active whenever the bike front speed is between 30 and 100km/h. The user must push and hold the Pit limiter switch for the system to remain active. When the Pit limiter is active all blue LEDs are active on the TC-Pod for the duration that the button is held down. If the button is held down for longer than 20 seconds it is presumed that the input or switch is damaged and a diagnostic message will appear on the Pod display. To save your changes, proceed as follows. • Press OK to save your changes. • Press this button to update the TCS module with your new map file. • This process will take approx 6 seconds. • During the transmission process and for 4 seconds afterwards the TC-Pod will flash an Error 5 and the bike cannot be started. This is perfectly normal. The Nemesis-TCS uses a Hall sensor fitted to the front and rear wheel speed to obtain wheel speed data via a dedicated trigger disk with 10 teeth. Under no circumstances must this be modified in any way. From the upper menu select Edit, followed by TC Setup to locate the wheel speed settings. Rear Speed - All Ducati in recent years have a very good quality Hall sensor fitted to the rear wheel which we link up to within the chassis loom in your kit. This signal remains linked to the ECU and is not affected by linking also to the TCS. Front speed – As part of your bike kit you will receive a new sensor, mounting bracket and a set of trigger teeth for using on the front wheel. These components should not be modified in any way, nor should any other pick-up devices or speed triggers be used on this wheel. Any attempt to modify this or use alternative pick-ups may seriously affect the system integrity. • Teeth per revolution – Define the number of pick up teeth for one wheel revolution. • Circumference – See note below. These values are pre-defined by us in order to provide you with an accurately matched set of speed data when the bike is banked over. It should also be noted that we do not guarantee the speed to be correct, as we are more concerned with the relative speed of the front and rear wheels. The tyre circumference you see here may not be exactly what you expect based on any static´measurements you make. The value here is the rolling circumference when the bike is leaned over and under load. The actual measured speed does not need to be very accurate; it only needs to be comparable with the rear wheel speed so that the front speed is 0.5% lower at the middle of the corner before the throttle is applied. Unless you use a data logger to measure this information using the ‘CAN stream’ we provide, your best solution for making adjustments yourself is to follow these rules, or use values provided by us and our dealers. Remember to try different map levels first. Problem...............TCS activity is insufficient at the middle of the corner when throttle is applied. Problem...............TCS activity is excessive at the middle of the corner when throttle is applied. Solution ...............Increase the front speed calibration in 0.5% steps until you achieve the results you want. Note that in the majority of cases it is not necessary to adjust this yourself as we have already defined these parameters for a wide variety of tyre makes, models and sizes. not be active. The RPM and Speed thresholds are fixed within your pre-loaded TCS map and are dependent on the type of bike. From the upper menu select Edit, followed by TC Setup to locate the throttle setting. For the majority of users we apply a default value for throttle activation as part of the map for your bike and adjustment is not necessary. However, users of Win-TC are able to define this parameter to fix the threshold slightly above the closed throttle value. Firstly the value of closed throttle should be viewed using the View Data window, See below "TC view Data". The Throttle activation point should then be adjusted to 2% above the closed throttle value. To save your changes, proceed as follows. Analogue throttle information is picked up directly from the sensor and pre-defined within the TCS map. Typically the traction control activation point is preset at approx 3deg of throttle. We apply default calibrations for the throttle based on average data from your model of bike. The TCS system is able to use any external quick shifter system that is able to provide a ‘short to gnd’ output signal. Basically this means that whenever the signal and the ground wire of the loom connector are linked together you will get a quick shift event. From the upper menu select Edit, followed by TC Setup to locate the Quick Shift setting. If Cut mode is selected the ignition is cut for duration chosen by the user. The cut starts as soon as the signal is seen from the shifter system. Further shifts are inhibited for 300msec after the end of the preceding shift. 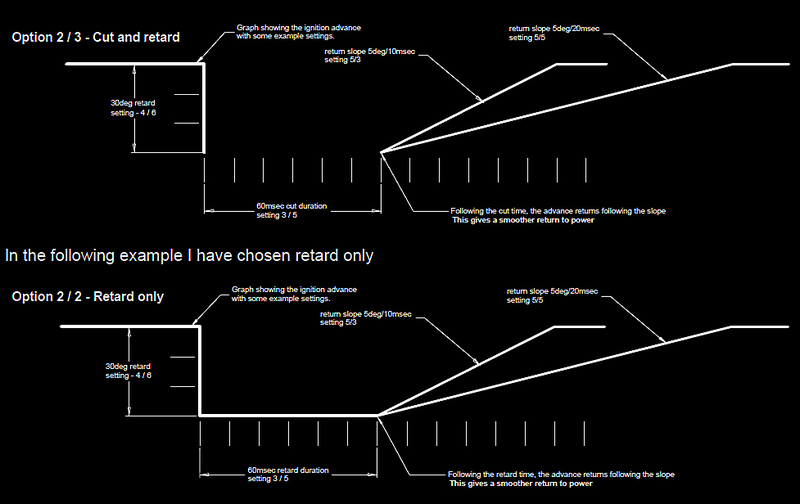 If Retard only mode is chosen the ignition continues to fire the coils but with a retard applied, as chosen by the user. • Ignition Cut – 65msec. • 5 degree every 10msec ‘return to normal’ slope. • The use of a large retard can cause post combustion in the exhaust leading to banging. • One 720 degree engine rotation at 11000rpm = 10.9msec. Switch that is ‘normally closed’ and opens the circuit when the shift level is pressed such as the Ducati Corse load-sensing lever. Switch that is ‘normally open’ and closes the circuit when the shift level is pressed such as the Nemesis shifters. The quick shifter status can be viewed in real time within the WinTC View Data window. To save your changes, proceed as follows. cannot be started. This is perfectly normal. In this example I have chosen a cut and retard. The ignition is removed for 60msec. When the ignition is re-activated there is a ‘retard’ of 30deg to make the power come back in at a lower level, and then a slope to return the power back to normal levels. This stops the bike breaking traction after a shift by applying all of the power very quickly. Note that the following diagrams shows a sloped return, in reality these are steps. There is no cut, just a time period with the ignition retarded by 30deg, then the slope back. This option can make a softer gear change. From the upper menu select File / Open and select the .s19 file that you wish to work on. Make any changes that you need as per the previous pages. To transmit a new map file to the TC module. • Turn on bike power. • Connect the WinTC-USB adaptor between your PC and Bike. • Wait until the TC-Pod has completed the start up sequence. • A progress bar will appear and indicate when the transmission is completed. From the upper menu select this icon to open the following window. This window provides real time data from the primary system inputs and allows you to check that the installation hasbeen done correctly. FW Release ...................Internal firmware release of the TC module. MAP Name.....................Name of the map as loaded by you or your dealer. MAP Rev ........................Incremental counter relating to the map release. Vbat ................................Internal monitor of system voltage (may be up to 200mV different from the battery). Position...........................Internal position sensor with value offset specific to the bike installation. Throttle ..........................Internally calibrated throttle angle, should be between minus 2 and plus 2.5 with the throttle closed. If not, contact your dealer. The max value can be anywhere between 90 and 110 and is mostly not important. Front speed ....................Value in Kmh – minimum measurable value is 11km/h. Rear speed.....................Value in Kmh – minimum measurable value is 11km/h. Quick shift ......................Turns from OFF to ON when the signal is applied. Speed limit......................Pit limiter switch status OFF or ON. The bar graph at the bottom of the screen moves continually when the system is transmitting data to WinTC.The TC-Pod will flash an Error. 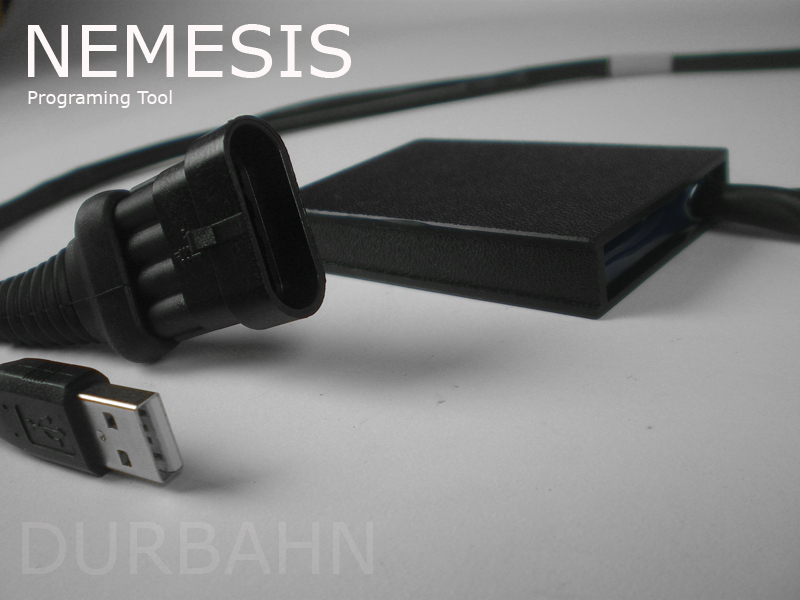 The Nemesis-TCS uses variable amounts ignition retard as the initial response to slip control therefore the ignition map within the ECU can play an important role in the amount of power reduction achieved at each slip response level. Any change to your ECU advance mapping can have a significant affect on the TCS response and control.